Fifteen Years After A Vaccine Scare, A Measles Epidemic : Shots - Health News A measles epidemic in Wales that has infected more than 1,000 people is the fallout from a fraudulent paper linking the vaccine and autism published almost 15 years ago, health officials say. 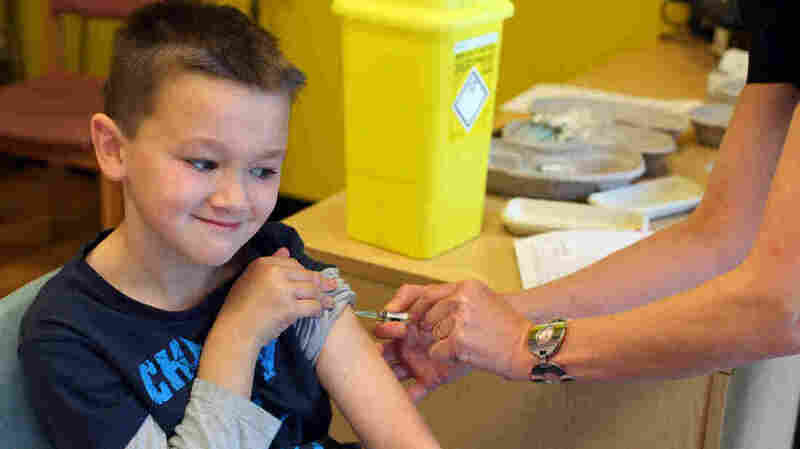 Luke Tanner, 7, gets vaccinated for measles at a clinic near Swansea, Wales, in April. Wales is at the center of a measles outbreak that has been linked to one death. Childhood vaccination rates plummeted in Great Britain after a 1998 paper by Dr. Andrew Wakefield claimed that the vaccine for measles, mumps and rubella had caused autism in a dozen children. That study has since been proven fraudulent, but it fueled fears about vaccine safety in Great Britain and the United States. "This is the legacy of the Wakefield scare," Dr. David Elliman, spokesman for the Royal College of Pediatrics and Child Health, told The Associated Press. Most of the measles cases have been in children and teenagers between the ages of 10 and 18, according to British health officials. In that age group, vaccination rates dropped below 50 percent in some parts of England after the Wakefield paper was published. Immunization rates have increased since then, with 90 percent of children under age 5 now fully vaccinated against measles. The BBC has mapped the fall and rise of vaccinations after the Wakefield scare, which closely matches cases in the current epidemic. "If someone came from another country with measles, it's going to run rampant in an area with a higher percentage of people who aren't vaccinated," says Dr. Aaron Glatt, an infectious disease specialist and chief administrative officer for Mercy Medical Center in Rockville Center, NY. He's a spokesman for the Infectious Disease Society of America. Each year there are about 60 cases of measles in the United States, according to the Center for Disease Control and Prevention. The disease was declared eliminated in this country in 2000. These new cases are caused by international travelers who bring the virus with them to the U.S.
Research over the past 15 years has shown that childhood vaccines don't cause autism, but parents continue to worry about vaccine safety. About one-third of parents say they worry that small children are getting too many shots too soon. "Nothing is without any risk," Glatt told Shots, noting that there will always be some risk of side effects and adverse reactions with vaccines. "But the risk of getting measles, which can be a fatal disease, more than outweighs that."